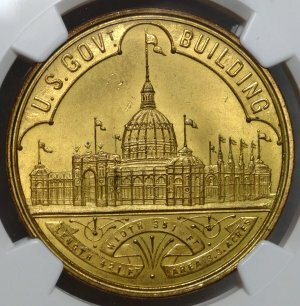 HK-22 1876 U. S. Centennial Exposition Official Medal MS63 (NGC 2618553-002)...Gilded version of the official U. S. Mint-struck souvenir medallion from the celebration of the 100th anniversary of American Independence, the first U. S. based World's Fair. 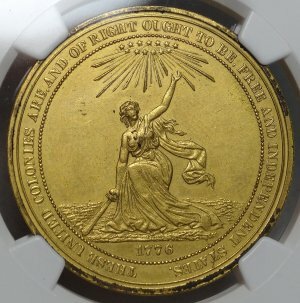 Less than 11,000 originally struck, which is considered relatively common in So Called Dollar terms ... compare this number to any number of coins considered very rare, and it gives you some idea of the value potential of this market. 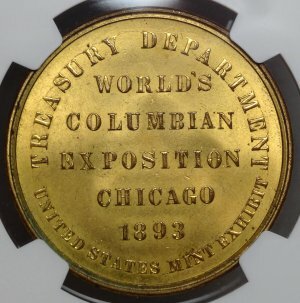 HK-154 1893 World's Columbian Exposition Official Medal, Type 1 MS65 (NGC 2618553-005)...A fully GEM Uncirculated example of this popular design, struck on the grounds of the Columbian Expo at the Treasury Exhibit. 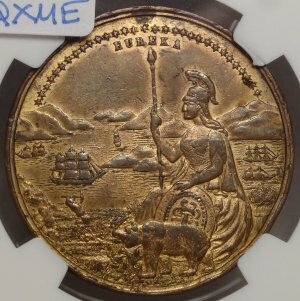 Certainly one of the dozen or so most common 19th Century So Called Dollars in terms of overall survivors, just based on the large number show, but few like this with original undamaged bright brass surfaces. 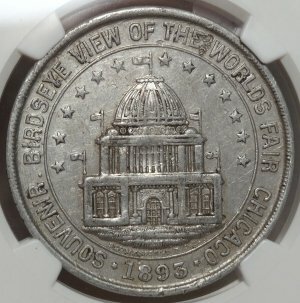 HK-166 1893 World's Columbian Exposition Bird's-Eye View Dollar AU50 (NGC 2618553-007)...Lightly circulated "pocket piece", not surprising given that the legend on the Reverse reads "Souvenir of the Opening of the World's Fair". 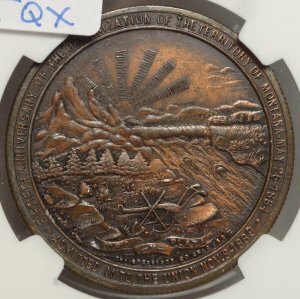 Quite scarce. 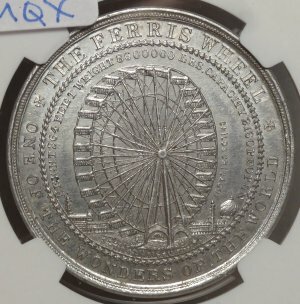 HK-171 1893 World's Columbian Exposition Ferris Wheel Dollar MS65 (NGC 2618553-008)...A bright piece showing the huge Ferris Wheel that was a prominant feature of the World's Fair, the first such installation in the country. 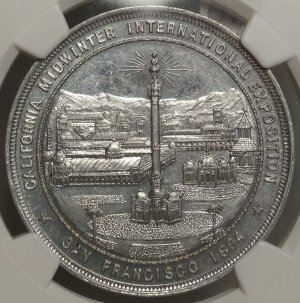 HK-249 1894 California Mid-Winter Exposition Electric Tower Dollar MS64 (NGC 2618553-009)...Very scarce without a hole, almost all seen were pierced at the top edge for mounting on a pin or ribbon. 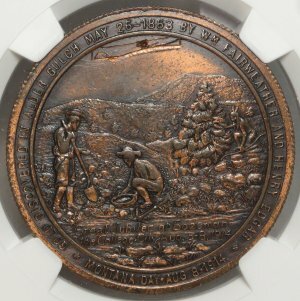 Rarer still in this condition; only two finer certified at NGC. HK-324 U.S.S. 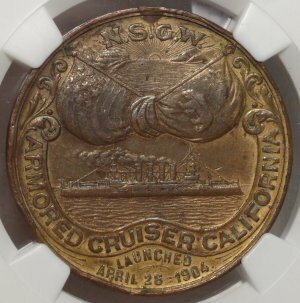 California Launching Dollar, Brass (Gilt) AU55 (NGC 2618553-013)...An exceptionally rare design, and an excellent commentary on buying rarity versus grade: there are only three such pieces graded by NGC in all grades, only one in Unc. 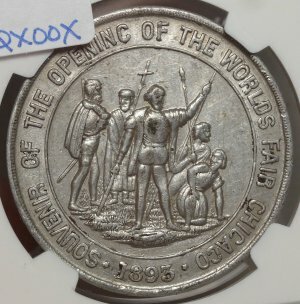 This after 10+ years of certifying tokens & medals and the development of an active market in graded So Called Dollars. 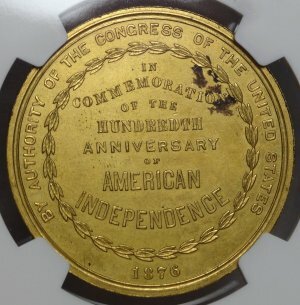 Originally issued on a badge (the small semi-circular area at the top edge is the remnant sign of the mount), almost all seen are significantly impaired, and therefor not gradable. 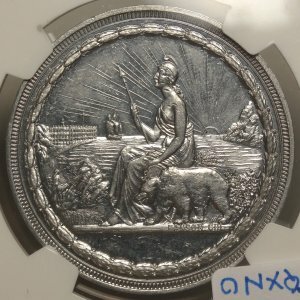 The question then is do you wait for a non-existant BU example to emerge, or take the opportunity to purchase any example when it becomes available? 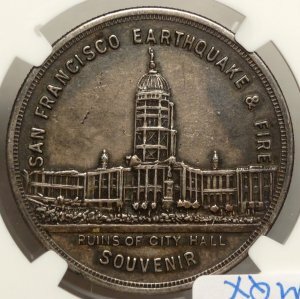 HK-340 1906 San Francisco Earthquake Commemorative Dollar AU55 (NGC 2618553-014)...Relatively scarce overall, extremely rare in Unc as almost all seem to have immediately gone into a pocket, as a result of their nature as a personal souvenir of surviving this disaster. 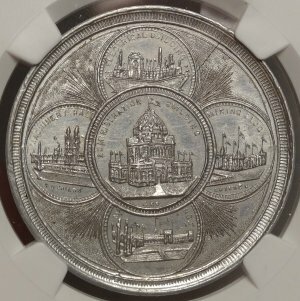 This copy has a significantly larger amount of the original silvering remaining than many even certified as AU-58. 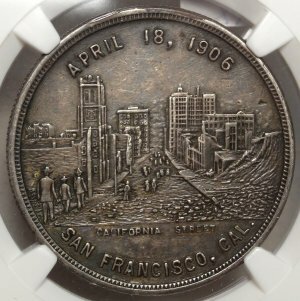 HK-662 Montana 25th Anniversary of Statehood Dollar Unc Details (NGC 2618553-020)...An enigmatic issue, possibly related to the construction of the Montana State Building at the 1915 World's Fair, although a second separate token is known as having been produced for that purpose.